On July 30, 2018, about 1000 central daylight time, a Beech A36 airplane, N1856W, impacted terrain following a power loss while on a visual approach to Brainerd Lakes Regional Airport (BRD), Brainerd, Minnesota. The private pilot and passenger were not injured, and the airplane was substantially damaged. The airplane was registered to and operated by the pilot under the provisions of 14 Code of Federal Regulations Part 91 as a personal flight. Day visual meteorological conditions prevailed for the flight, which departed from Poplar Grove Airport (C77), Poplar Grove, Illinois about 0807. About two miles prior to landing at BRD, the pilot noticed the engine sputter and stop. He attempted several corrective actions, to include switching to the right tank on the fuel selector and increasing the mixture control, with no effect. The pilot executed a forced landing into birch trees, which damaged both wings. The airplane came to rest nose down and the pilot and passenger exited without injury. The airplane has been recovered for further examination. An Illinois couple, frequently flying from their home state to the Brainerd lakes area, were injured when their single-engine airplane crashed Monday, July 30. The crash occurred less than a mile and a half away from where they were scheduled to land at the Brainerd Lakes Regional Airport. The crash, reported at 10:05 a.m., ignited a large response of emergency personnel from the Crow Wing County Sheriff's Office, North Memorial Ambulance and Air Care, Minnesota State Patrol, Brainerd Fire Department, airport personnel and the Crosby Police Department—the first agency on scene. Chief Deputy Denny Lasher of the Crow Wing County Sheriff's Office said the Beech A36 Bonanza crashed just south of what is called Runway 34 at the Brainerd airport in Oak Lawn Township. Lasher said finding the aircraft was difficult as the terrain was heavily wooded with thick brush and swampland. Sheriff and police personnel were up to their hips in muck trying to find the couple. Sheriff personnel stayed in communication with the couple—Vincent and Jody Facchiano, both age 60, of Belvidere, Ill.—to try to locate them. Authorities also tracked the couple's cellphone signal in an effort to locate them. 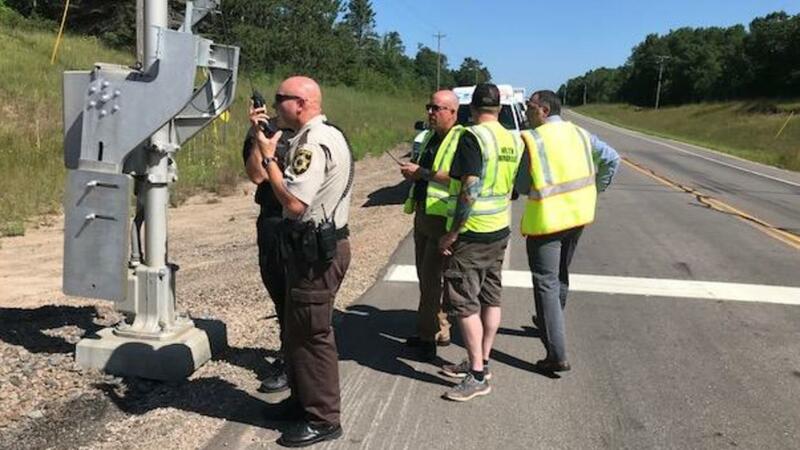 The six-seat aircraft crashed somewhere northeast of Brainerd, east of the airport and Highway 210, and to the west to Demery Road, near Shannon's Auto Body in Brainerd. 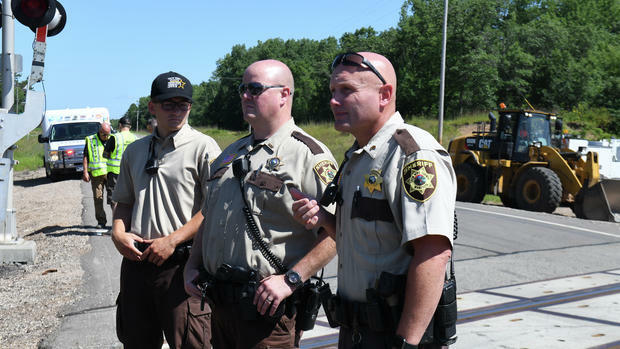 Authorities set up posts to conduct their efforts at two different locations—one off Three Mile Road and the other off Crow Wing County Highway 25. Emergency personnel learned the aircraft was near the BNSF Railway railroad tracks. Crews were working on the railroad tracks and stopped their work while authorities looked for the injured couple in the aircraft. 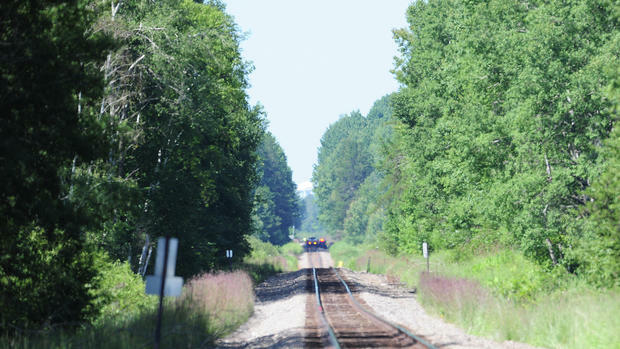 Lasher said personnel took a squad vehicle down the railroad tracks as far as they could to where the aircraft crashed. Then they went into the woods on foot. All the agencies worked together and state patrol used its helicopter to locate the aircraft. Once located, the couple was able to walk to the helicopter, which landed nearby. They were then airlifted from the scene to the Brainerd airport because of the remote area and rough terrain. From the airport, the couple was transported by ambulance to Essentia Health-St. Joseph's Medical Center in Brainerd. Later Monday afternoon, a hospital spokesperson stated Jody Facchiano was treated and released and Vincent Facchiano was in good condition. Sgt. Andy Galles of the sheriff's office said the couple had minor injuries, including some bumps and bruises. Galles said the pilot, Vincent Facchiano, told them the engine failed upon approach and the aircraft was unable to reach the runway. The aircraft crashed, snapping off branches of trees before landing in the thick brush. The National Transportation Safety Board and Federal Aviation Administration will investigate the cause of the engine failure and crash. "They are very fortunate that they are OK," Lasher said of the couple. The Crow Wing County Sheriff's Department reports a husband and wife survived a plane crash near the Brainerd Lakes Regional Airport Monday morning with only minor injuries. A release stated the department received a call from Jody Facchiano, 60 of Belvidere, Illinois, just after 10 a.m. Monday saying she and her husband Vincent, also 60, had just survived a plane crash. She said the crash occurred as the plane was attempting to land on runway 34 at the airport. The release went on to say directions provided by Jody Facchiano, as well as cell phone pings, helped authorities locate the area of the crash - a heavily wooded and lowland area about 1.4 miles southeast of the airport in Oak Lawn Township. According to the release, the sheriff's department - with assistance from the state patrol - located the couple as they attempted to walk out of the crash site. 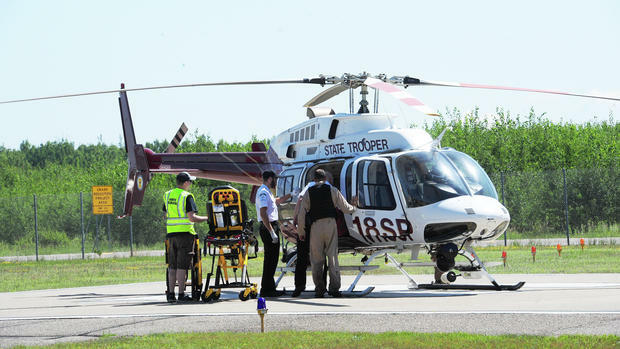 They were airlifted from the area by a state patrol helicopter, then transferred to an ambulance that took them to Essentia Hospital in Brainerd where they were treated for what were described as minor injuries. The release states Vincent Facchiano said he and his wife were flying to Brainerd from Illinois, and that he had experienced engine failure upon approach to the airport. Deputies were unable to reach the crash site itself due to the terrain. The National Transportation Safety Board and the Federal Aviation Administration have been notified and the matter remains under investigation. It seems sometimes thick brush can be your best friend in a forced landing.